What are osteoarthritis symptoms and signs? How do health care professionals diagnose osteoarthritis? What are osteoarthritis treatment options? "If I have minimal or no symptoms with early signs of osteoarthritis, what should I do?" What is the prognosis for patients with osteoarthritis? Is it possible to prevent osteoarthritis? What does the future hold for osteoarthritis? Where can people get more information about osteoarthritis? Osteoarthritis is a joint inflammation that results from cartilage degeneration. Osteoarthritis can be caused by aging, heredity, and injury from trauma or disease. loss of range of motion. There is no blood test for the diagnosis of OA. The goal of treatment in osteoarthritis is to reduce joint pain and inflammation while improving and maintaining joint function. Osteoarthritis is a form of arthritis that features the breakdown and eventual loss of the cartilage of one or more joints. Cartilage is a protein substance that serves as a "cushion" between the bones of the joints. Among the over 100 different types of arthritis conditions, osteoarthritis is the most common joint disease. OA occurs more frequently as we age. Before age 45, osteoarthritis occurs more frequently in males. After 55 years of age, it occurs more frequently in females. In the United States, all races appear equally affected. A higher incidence of osteoarthritis exists in the Japanese population, while South-African blacks, East Indians, and Southern Chinese have lower rates. Osteoarthritis is abbreviated as OA or referred to as degenerative arthritis or degenerative joint disease (DJD). Osteoarthritis commonly affects the hands, feet, spine, and large weight-bearing joints, such as the hips and knees. Osteoarthritis usually has no known cause and is referred to as primary osteoarthritis. When the cause of the osteoarthritis is known, the condition is referred to as secondary OA. Osteoarthritis is a chronic joint disorder of cartilage. It is not a systemic disease. It is not an autoimmune disease. Rheumatoid arthritis is an autoimmune disease, therefore, it features a misdirected immune system that attacks body tissues (particularly the joint lining tissue called synovium). Rheumatoid arthritis is also a systemic disease. Therefore, rheumatoid arthritis can attack tissues throughout the body beyond affected joints, including the lungs, eyes, and skin. Primary (idiopathic) osteoarthritis, OA not resulting from injury or disease, is partly a result of natural aging of the joint. With aging, the water content of the cartilage increases, and the protein makeup of cartilage degenerates as a function of biologic processes. Eventually, cartilage begins to degenerate by flaking or forming tiny crevasses. In advanced osteoarthritis, there is a total loss of the cartilage cushion between the bones of the joints. Repetitive use of the worn joints over the years can mechanically irritate and inflame the cartilage, causing joint pain and swelling. Loss of the cartilage cushion causes friction between the bones, leading to pain and limitation of joint mobility. Inflammation of the cartilage can also stimulate new bone outgrowths (spurs, also referred to as osteophytes) to form around the joints. Osteoarthritis occasionally can develop in multiple members of the same family, implying a hereditary (genetic) basis for this condition. Osteoarthritis is therefore felt to be a result of a combination of each of the above factors that ultimately lead to a narrowing of the cartilage in the affected joint. Secondary osteoarthritis is a form of osteoarthritis that is caused by another disease or condition. Conditions that can lead to secondary osteoarthritis include obesity, repeated trauma or surgery to the joint structures, abnormal joints at birth (congenital abnormalities), gout, diabetes, and other hormone disorders. Obesity causes osteoarthritis by increasing the mechanical stress on the joint and therefore on the cartilage. In fact, next to aging, obesity is the most significant risk factor for osteoarthritis of the knees. The early development of osteoarthritis of the knees among weight lifters is believed to be in part due to their high body weight. Repeated trauma to joint tissues (ligaments, bones, and cartilage) is believed to lead to early osteoarthritis of the knees in soccer players and army military personnel. Interestingly, health studies have not found an increased risk of osteoarthritis in long-distance runners. Some people are born with abnormally formed joints (congenital abnormalities) that are vulnerable to mechanical wear, causing early degeneration and loss of joint cartilage. Osteoarthritis of the hip joints is commonly related to structural abnormalities of these joints that had been present since birth. Hormone disturbances, such as diabetes and growth hormone disorders, are also associated with early cartilage wear and secondary osteoarthritis. Osteoarthritis is a disease that is isolated to the cartilage of the joints. Unlike many other forms of arthritis that are systemic illnesses (conditions that affect multiple areas of the body apart from the joints), such as rheumatoid arthritis and systemic lupus, osteoarthritis does not affect other organs of the body. The most common symptom of osteoarthritis is pain in the affected joint(s) after repetitive use. This can lead to knee pain, hip pain, finger joint pain, ankle pain, foot pain, wrist pain, and shoulder pain with loss of range of motion and function. Joint pain of osteoarthritis is usually worse later in the day. There can be swelling, warmth, and creaking of the affected joints. Pain and stiffness of the joints can also occur after long periods of inactivity (for example, sitting in a theater). In severe osteoarthritis, complete loss of the cartilage cushion causes friction between bones, causing pain even at rest or pain with limited motion. Symptoms of osteoarthritis vary greatly from patient to patient. Some patients can be debilitated by their symptoms. On the other hand, others may have remarkably few symptoms in spite of dramatic degeneration of the joints apparent on X-rays. Symptoms also can be intermittent. It is not unusual for patients with osteoarthritis of the finger joints of the hands and knees to have years of pain-free intervals between symptoms. Osteoarthritis of the knees is often associated with excess upper body weight, with obesity, or a history of repeated injury and/or joint surgery. Progressive cartilage degeneration of the knee joints can lead to deformity and outward curvature of the knees, which is referred to as being "bowlegged." People with osteoarthritis of the weight-bearing joints (such as the knees) can develop a limp. The limping can worsen as more cartilage degenerates. In some patients, the pain, limping, and joint dysfunction may not respond to medications or other conservative measures. Therefore, severe osteoarthritis of the knees is one of the most common reasons for total knee replacement medical procedures in the United States. Osteoarthritis of the cervical spine or lumbar spine causes pain in the neck or low back. Bony spurs, called osteophytes, that form along the arthritic spine can irritate spinal nerves, causing severe pain that can radiate from the spine as well as numbness and tingling of the affected parts of the body. Osteoarthritis causes the formation of hard, bony enlargements of the small joints of the fingers. Classic bony enlargement of the small joint at the end of the fingers is called a Heberden's node, named after a famous British doctor. The bony deformity is a result of the bone spurs from the osteoarthritis in that joint. Another common bony knob (node) occurs at the middle joint of the fingers in many patients with osteoarthritis and is called a Bouchard's node. Dr. Bouchard was a famous French doctor who also studied arthritis patients in the late 1800s. Heberden's and Bouchard's nodes may not be painful, but they are often associated with limitation of motion of the joint. The characteristic appearances of these finger nodes can be helpful in diagnosing osteoarthritis. Osteoarthritis of the joint at the base of the big toe of the foot leads to the formation of a bunion. Osteoarthritis of the fingers and the toes may have a genetic basis and can be found in numerous female members of some families. There is no blood test for the diagnosis of osteoarthritis. Blood tests are performed to exclude diseases that can cause secondary osteoarthritis, as well as to exclude other arthritis conditions that can mimic osteoarthritis. X-rays of the affected joints can be used to diagnose osteoarthritis. The common X-ray findings of osteoarthritis include loss of joint cartilage, narrowing of the joint space between adjacent bones, and bone spur formation. Simple X-ray testing can also be very helpful to exclude other causes of pain in a particular joint as well as assisting the decision-making as to when surgical intervention might be considered. Arthrocentesis is a procedure to remove joint fluid that is often performed in a health care professional's office. During arthrocentesis, a sterile needle is used to remove joint fluid for analysis. Joint fluid analysis is useful in excluding gout, infection, and other causes of arthritis. Removal of joint fluid and injection of corticosteroids into the joints during arthrocentesis can help relieve pain, swelling, and inflammation. Arthroscopy is a surgical technique whereby a doctor inserts a viewing tube into the joint space. Abnormalities of and damage to the cartilage and ligaments can be detected and sometimes repaired through the arthroscope. If successful, patients can recover from the arthroscopic surgery much more quickly than from open joint surgery. Finally, a careful analysis of the location, duration, and character of the joint symptoms and the appearance of the joints helps the doctor in diagnosing osteoarthritis. 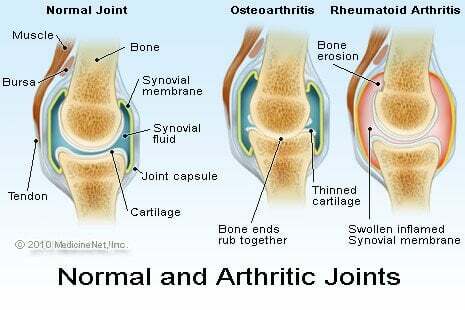 Bony enlargement of the joints from spur formations is characteristic of osteoarthritis. Therefore, the presence of Heberden's nodes, Bouchard's nodes, and bunions of the feet can indicate to the doctor a diagnosis of osteoarthritis. Aside from weight reduction and avoiding activities that exert excessive stress on the joint cartilage, there is no specific medical treatment to halt cartilage degeneration or to repair damaged cartilage in osteoarthritis. The goal of treatment in osteoarthritis is to reduce joint pain and inflammation while improving and maintaining joint function. Some patients with osteoarthritis have minimal or no pain and may not need treatment. Others may benefit from conservative measures such as rest, exercise, diet control with weight loss, physical therapy and/or occupational therapy, and mechanical support devices, such as knee braces. These measures are particularly important when large, weight-bearing joints are involved, such as the hips or knees. In fact, even modest weight reduction can help to decrease symptoms of osteoarthritis of the large joints, such as the knees and hips. Medications are used to complement the physical measures described above. Medication may be used topically, taken orally, or injected into the joints to decrease joint inflammation and pain. When conservative measures fail to control pain and improve joint function, surgery can be considered. Resting sore joints decreases stress on the joints and relieves pain and swelling. Patients are asked to simply decrease the intensity and/or frequency of the activities that consistently cause joint pain. Physical activity usually does not aggravate osteoarthritis when performed at levels that do not cause joint pain. Exercise is helpful for relief of symptoms of osteoarthritis in several ways, including strengthening the muscular support around the joints. It also prevents the joints from "freezing up" and improves and maintains joint mobility. Finally, it helps with weight reduction and promotes endurance. Applying local heat before and cold packs after exercise can help relieve pain and inflammation. Swimming is particularly well suited for patients with osteoarthritis because it allows patients to exercise with minimal impact stress to the joints. Other popular exercises include walking, stationary cycling, and light weight training. Physical therapists can provide support devices, such as splints, canes, walkers, and braces. These medical devices can be helpful in reducing stress on the joints. Occupational therapy can assess the demands of daily activities and suggest additional devices that may help people at work or home. Finger splints can support individual joints of the fingers. Paraffin wax dips, warm water soaks, and nighttime cotton gloves can help ease hand symptoms. Spine symptoms can improve with a neck collar, lumbar corset, or a firm mattress, depending on what areas are involved. In many patients with osteoarthritis, mild pain relievers such as aspirin and acetaminophen (Tylenol) may be sufficient treatment. Studies have shown that acetaminophen given in adequate doses can often be equally as effective as prescription anti-inflammatory medications in relieving pain in osteoarthritis of the knees. Since acetaminophen has fewer gastrointestinal side effects than NSAIDS (see below), especially among elderly people, acetaminophen is generally the preferred initial drug given to patients with osteoarthritis. Medicine to relax muscles in spasm might also be given temporarily. Pain-relieving creams applied to the skin over the joints can provide relief of minor arthritis pain. Examples include capsaicin (ArthriCare, Zostrix), salicin (Aspercreme), methyl salicylate (Ben-Gay, Icy Hot), and menthol (Flexall). New topical treatments include an anti-inflammatory lotion, diclofenac (Voltaren Gel, Pennsaid) and diclofenac patch (Flector Patch), which are used for the relief of the pain of osteoarthritis. Non-steroidal anti-inflammatory drugs (NSAIDs) are medications that are used to reduce pain and inflammation in the joints. Examples of NSAIDs include aspirin (Ecotrin), ibuprofen (Motrin), nabumetone (Relafen), and naproxen (Naprosyn). It is sometimes possible to use NSAIDs temporarily and then discontinue them for periods of time without recurrent symptoms, thereby decreasing the risk of side effects. The most common side effects of NSAIDs involve gastrointestinal distress, such as stomach upset, cramping diarrhea, ulcers, and even bleeding. The risk of these and other side effects increases in the elderly. Newer NSAIDs called COX-2 inhibitors have been designed that have less toxicity to the stomach and bowels. Because osteoarthritis symptoms vary and can be intermittent, these medicines might be given only when joint pains occur or prior to activities that have traditionally brought on symptoms. Some studies, but not all, have suggested that alternative treatment with the food supplements glucosamine and chondroitin can relieve symptoms of pain and stiffness for some people with osteoarthritis. These supplements are available in pharmacies and health-food stores without a prescription, although there is no certainty about the purity of the products or the dose of the active ingredients because they are not monitored by the U.S. FDA. The National Institutes of Health studied glucosamine in the treatment of the pain of osteoarthritis. Their initial research demonstrated only a minor benefit in relieving pain for those with the most severe osteoarthritis, and in most patients, there was no benefit greater than that from placebo pills. Further studies, it is hoped, will clarify many issues regarding dosing, safety, and effectiveness of different formulations of glucosamine for osteoarthritis. Patients taking blood thinners should be careful when taking chondroitin as it can increase the blood thinning and cause excessive bleeding. Fish-oil supplements have been shown to have some anti-inflammatory properties, and increasing the dietary fish intake and/or taking fish-oil capsules (omega-3 capsules) can sometimes reduce the inflammation of arthritis. While oral cortisone is generally not used in treating osteoarthritis, when injected directly into the inflamed joints, it can rapidly decrease pain and restore function. Since repetitive cortisone injections can be harmful to the tissues and bones, they are reserved for patients with more pronounced symptoms. For persisting pain of severe osteoarthritis of the knee that does not respond to weight reduction, exercise, or medications, a series of injections of hyaluronic acid (Synvisc, Hyalgan, Orthovisc, Supartz, Euflexxa) into the joint can sometimes be helpful, especially if surgery is not being considered. These products seem to work by temporarily restoring the thickness of the joint fluid, allowing better joint lubrication and impact capability, and perhaps by directly affecting pain receptors. Surgery is generally reserved for those patients with osteoarthritis that is particularly severe and unresponsive to the conservative treatments. Arthroscopy, discussed above, can be helpful when cartilage tears are suspected. Osteotomy is a bone-removal procedure that can help realign some of the deformity in selected patients, usually those with certain forms of knee disease. In some cases, severely degenerated joints are best treated by fusion (arthrodesis) or replacement with an artificial joint (arthroplasty). Total hip and total knee replacements are now commonly performed in community hospitals throughout the United States. These can bring dramatic pain relief and improved function. The ideal steps to take should lead to a proper diagnosis and an optimal long-term treatment plan. While many steps are described here, the plan must be customized for each person affected by osteoarthritis, depending on the joints affected and the severity of symptoms. An opinion regarding the cause or the type of the arthritis can often be adequately obtained by consulting a general family doctor. It is often unnecessary to see an arthritis specialist (rheumatologist), like myself, for this purpose. However, if the diagnosis or treatment plan is unclear, a rheumatologist might be consulted. When I determine that a patient has a classic node formation from osteoarthritis (Heberden's node), I may make the diagnosis solely based upon the examination, without the need for any additional tests, such as blood or X-ray testing. Sometimes, testing can be helpful to better understand the degree and character of the osteoarthritis affecting a certain joint. It can also be helpful for monitoring and to exclude other conditions. Treatment may not be necessary for osteoarthritis of the hands with minimal or no symptoms. When symptoms are troubling and persist, however, treatment might include pain and anti-inflammatory medications, with or without food supplements, such as glucosamine and/or chondroitin. Furthermore, heat/cold applications and topical pain creams can be helpful. As a first step, I recommend that patients go ahead and try the over-the-counter food supplements glucosamine and chondroitin. Each of these health supplements has been shown by some studies to relieve the pain and stiffness of some (but not all) patients with osteoarthritis. These supplements are available in pharmacies and health-food stores without a prescription. If patients do not benefit after a two-month trial, I suggest that they discontinue these supplements. Of note, the manufacturers sometimes make claims that these supplements "rebuild" cartilage. This claim has not been adequately verified by scientific studies to date. For another type of dietary supplementation, it should be noted that fish oils have been shown to have some anti-inflammatory properties. Moreover, increasing the dietary fish intake and/or fish oil capsules (omega-3 capsules) can sometimes reduce the inflammation of arthritis. There is some evidence that vitamin D supplementation can reduce joint swelling of osteoarthritis. Obesity has long been known to be a risk factor for osteoarthritis of the knee. I recommend weight reduction for patients who are overweight with early signs of osteoarthritis of the hands, because they are at a risk for also developing osteoarthritis of their knees. Foods to avoid include those that promote weight gain. As described above, even modest weight reduction can be helpful. Pain medications that are available over the counter, such as acetaminophen (Tylenol), can be very helpful in relieving the pain symptoms of mild osteoarthritis. I recommend these as the first-line medication treatment. Studies have shown that acetaminophen, given in adequate doses, can often be equally as effective as prescription anti-inflammatory medications in relieving pain in osteoarthritis of the knees. Since acetaminophen has fewer gastrointestinal side effects than nonsteroidal anti-inflammatory drugs (NSAIDS), especially in elderly patients, acetaminophen is generally the preferred initial drug given to patients with osteoarthritis. If symptoms persist, then I recommend trials of over-the-counter anti-inflammatory drugs such as ibuprofen (Advil, Motrin IB, Nuprin), ketoprofen (Orudis), and naproxen (Aleve). Many patients do best when they take these medications along with their glucosamine and chondroitin supplements. Some patients get significant relief of pain symptoms by dipping their hands in hot wax (paraffin) dips in the morning. Hot wax can often be obtained at local pharmacies or medical supply stores. It can be prepared in a Crock-Pot and be reused after it hardens as a warm covering over the hands by peeling off and replacing it into the melted wax. Warm water soaks and nighttime cotton gloves (to keep the hands warm during sleep) can also help ease hand symptoms. Performing gentle, low-impact range of motion exercises regularly can help to preserve function of the joints. These exercises are easiest to perform after early morning hand warming. Pain-relieving creams that are applied to the skin over the joints can provide relief of daytime minor arthritis pain. Examples include capsaicin (ArthriCare, Zostrix), salicin (Aspercreme), methyl salicylate (Ben-Gay, Icy Hot), and menthol (Flexall). For additional relief of mild symptoms, local ice application can sometimes be helpful, especially toward the end of the day. Occupational therapists can assess daily activities and determine which additional types of therapy may help patients at work or home. Finally, when arthritis symptoms persist, it is best to seek the advice of a health care professional who can properly guide the optimal management for each individual patient. Many other prescription medications are available for the treatment of osteoarthritis for patients with chronic, annoying symptoms. In addition to the steps described above, pay attention to joint problems elsewhere in the body if one develops early signs and symptoms of osteoarthritis of the hands. The prognosis of patients with osteoarthritis depends on which joints are affected and whether or not they are causing symptoms and impaired function. Some patients are unaffected by osteoarthritis while others can be severely disabled. Joint replacement surgery for some results in the best long-term outcome. Finally, if one is concerned that osteoarthritis could be lead to injury of the internal organs, don't be. Osteoarthritis does not cause internal organ damage or blood-test abnormalities. There is no prevention of osteoarthritis with the exception of avoiding joint injury. Osteoarthritis is treated by general practitioners, family practitioners, internists, orthopedists, rheumatologists, physical therapists, occupational therapists, orthotists, physiatrists, and other rehabilitation specialists. In the future, medications may be available that protect the cartilage from the deteriorating consequences of osteoarthritis. Research into cartilage biology will eventually lead to new and exciting breakthroughs in the management of osteoarthritis. Surgical innovation has led to a technique for the repair of isolated splits of cartilage (fissures) of the knee. In this procedure, a patient's own cartilage is actually grown in the laboratory, then inserted into the fissure area and sealed over with a "patch" of the patient's own bone covering the tissue. While this is not a procedure for the cartilage damage of osteoarthritis, it does open the door for future cartilage research. These and other developing areas hold promise for new approaches to an old problem. Investigators at the National Institutes of Health have found that taking glucosamine did not significantly improve symptoms of osteoarthritis compared to placebo. Studies are under way to look at whether some glucosamine formulations may have advantages over others. Contact the Arthritis Foundation for additional information. Klippel, John H., et al., eds. Primer on the Rheumatic Diseases. New York: Springer and Arthritis Foundation, 2008. Ruddy, Shaun, et al., eds. Kelley's Textbook of Rheumatology, Sixth Ed. Philadelphia: Saunders, 2001.